Defence is the hardest part of bridge and even top-class players make mistakes much too frequently. Part 1 of "The Deadly Defence Quiz Book" by Ron Klinger gives insights into how to become a deceptive defender and how to recognize special defensive situations. Part 2 consists of a series of quizzes and the answers contain the logic and reasoning behind the correct play. After all the quizzes have been completed, you will be amazed at how much more clearly you can see the winning defence at the table. And practice makes perfect if you tackle the problems again every three to six months. There is a lot of emphasis in the book on helping partner to pass vital information so that partner will be pointed into the right direction to find the winning play. No bridge player can come away from this book without a greater insight into how to be an accomplished defender. "Streamline Your Bidding with 1100 Quizzes" by Victor Mollo. 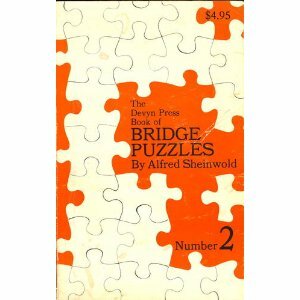 The author is famous for his humorous bridge books, but also for serious ones such as the classic "card play Technique"
From Marty Bergen, the author of the award winning book 'Points Smoints', you can now sharpen your skills and fill in the gaps with "Bergen's Best Bridge Quizzes vol 1"
"Mr. Bridge's Quiz and Puzzle Book", aka "Collins Bridge Quiz Book" by Bernard (Mr Bridge) Magee is laid out in an easy-to-use format with questions on the right hand page and answers on the next page. In all, there are more than 150 trivia questions and 80 full-page bridge problems. With chapters on rubber, duplicate and team bridge as well as a wide scope of conventions focusing around both the weak and strong no trump, there is enough instruction to satisfy players of all standards and preferences. Guaranteed to give hours of fun to any bridge player. "Bridge Quiz " by Ben Cohen, who pioneered duplicate bridge in the UK in the early 1930s and contributed to the development of the Acol bidding system. 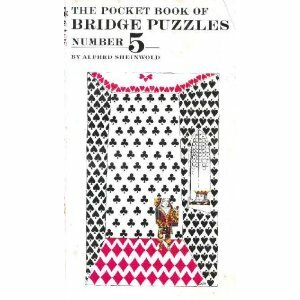 "Bridge Quiz for Improving Players " by Hugh Kelsey presents 60 bridge problems in the play of the cards, this quiz book challenges readers to test their skills, and aims to help improving players progress towards expert status. Hugh Kelsey has twice won the Gold Cup, and Tim Bourke has won five Australian national titles. "Bridge: The Ultimate Limits " by Eric Mansfield is a different kind of quiz book. There are 45 extreemly difficult problems of a unique nature. You are given the N-S hands and askes to constrct the E-W hands so that the seemingly impossible contract can be made. The deals are very difficult, and even if you deduce what the E-W hands must be, you will need all of you declarer skills such as a quintuple unblock, multiple squeezes and end-plays to make the contract. Or buy from . "What Would You Bid? " by Terence Reese. This book is the result of the author raiding the stock of hands in bridge magazine bidding competitions for interesting and instructive hands. In the BRIDGE QUIZ series by Raymond/Sally Brock, each book is aimed at bridge players of all levels who wish to test their ability in the areas of declarer play, defence and bidding..